This tender film plays out in an isolated village separated from the world by a broken bridge that no one has sought fit to repair. Within the insular community lives the beautiful, sweet natured Lazzaro (talented newcomer Adriano Tardiolo) whose people-pleasing personality is often mistaken for simple-mindedness. 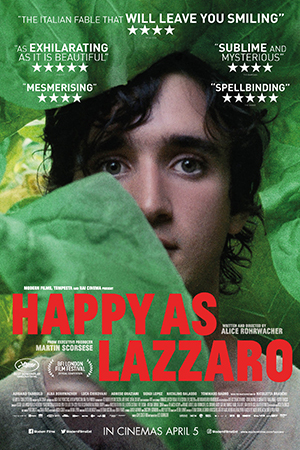 Lazzaro is persuaded by the village ruler’s son to help him fake his own kidnapping and steal the ransom. However, the unlikely duo’s plans are soon derailed. Beautifully shot on Super 16mm by Rohrwacher’s regular cinematographer Hélène Louvart and with echoes of Pasolini, Fellini and Jarman, this heady concoction of folk tales, biblical allegory, social critique and pop culture references, deservedly won the Best Screenplay award at this year’s Cannes.